68% of Israeli Jews back Trump's plan to move US embassy to Jerusalem. 83% say IDF justified to shoot Gaza rioters who approach border. Israeli Jews overwhelmingly back President Donald Trump’s plans to relocate the US embassy in Israel from Tel Aviv to Jerusalem, a new poll shows. On December 6th 2017, President Trump announced that the US would recognize Jerusalem as Israel’s capital city, and disclosed that he had ordered the US State Department to prepare to relocate the embassy from Tel Aviv to Jerusalem. The embassy move is expected to be completed in three stages. 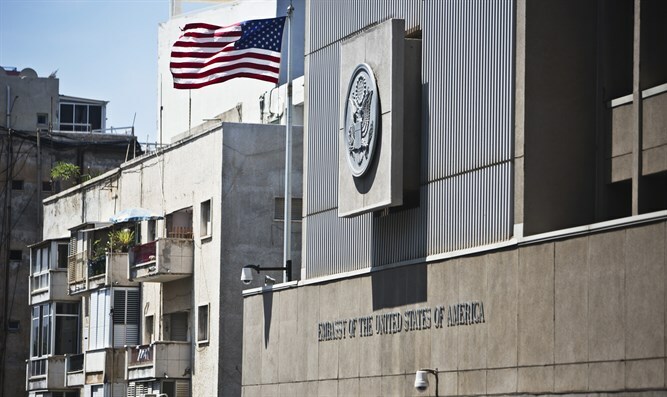 On May 14th, coinciding with the 70th anniversary of Israel’s establishment on the Gregorian calendar, the US will officially transfer the ambassador’s office from Tel Aviv to a facility currently used as a consulate in the Arnona neighborhood of Jerusalem. The consulate will be designated as the US embassy, and a limited number of staff members transferred along with the ambassador from Tel Aviv. At a later date, possibly as early as late 2019, the embassy complex in Jerusalem will be expanded with the addition of an annex building to house more staff members currently assigned to Tel Aviv. In the third and final phase, the US will build a new, larger embassy complex somewhere in Jerusalem. No location has yet been selected, and the process of completing the permanent embassy facility is expected to take years. Israel leaders hailed President Trump’s decision, which implemented the 1995 Jerusalem Embassy Act. While the law required that the president move the embassy to Jerusalem no later than 1999, successive presidents have skirted the requirement by signing security waivers every six months. Following President Trump’s December 6th declaration, rioting broke out across the Muslim world, with leaders of Muslim-majority nations condemning the decision. According to the new Peace Index survey, set to be released in full on Wednesday, more than two-thirds of Israeli Jews back the president’s decision, and believe it benefits Israel. The poll, conducted by Tel Aviv University and the Israel Democracy Institute, shows that 63% of all Israelis – both Arabs and Jews – say the embassy move benefits Israel. Among Israeli Jews, 68% say the move is beneficial for Israel, compared to roughly one-quarter who disagreed. In addition, the new poll shows that Israeli Jews strongly back the IDF’s policy for securing Israel’s border with Gaza in the face of violent protests and attempts to infiltrate into Israel from the Hamas-ruled Gaza Strip. Since March 30th, tens of thousands of rioters have clashed with Israeli security personnel along the Israel-Gaza frontier. Israeli security officials have warned Gazans that rioters attempting to infiltrate into Israel or attack Israeli personnel will be fired upon. Eighty-three percent of Israeli Jews say they support this policy, the poll shows, compared to just 6% of Israeli Arabs who feel the policy is justified.